How can Astrology affect someone who is dead ? Everyone has a birthchart but that’s for this life only, surely. The planets do keep on moving though and continuing to make new angles to the birth positions even after the person who represented those placings has passed on so the legacy of that person can be profoundly affected. Jimmy Savile was a popular figure whilst he was alive. He brought pop music into the lives of one generation and fixed things for another, he appeared to be constantly on TV and was widely heralded as a philanthropist raising fortunes for many charities. He happily ran marathons right into old age and even looked after his Mum. What’s not to like ? Since he died, however, that’s another matter. The Metropolitan Police announced that the allegations of sexual abuse reported against Savile had reached unprecedented levels in November 2012. How could someone who was so widely loved and appreciated sink to such depths and also how could he keep it all so secret over so many years ? There’s only one sign that could get away with it, Scorpio. Scorpio’s are capable of living on many different levels. Its well documented astrologically that they are capable of the highest but also the lowest kinds of motivation even at the same time. The Scorpio theme is regeneration and the Scorpio character is always challenged to work with deep and intense feelings and energy in order to purify and express them on a higher level. It’s a tall order and they don’t all succeed. Scorpio’s are generally quite private people and they have a great deal of self control. They can be secretive and unless you know them well you would not sense the depth of feeling they experienced. If there’s one sign that could keep a more shady part of their lives from being exposed it would be Scorpio. Unfortunately there is no birthtime available for Savile so the chart is drawn for noon. It’s not possible to see his Ascendant or which houses the planets are in, knowledge which would make a much more complete understanding of his character. 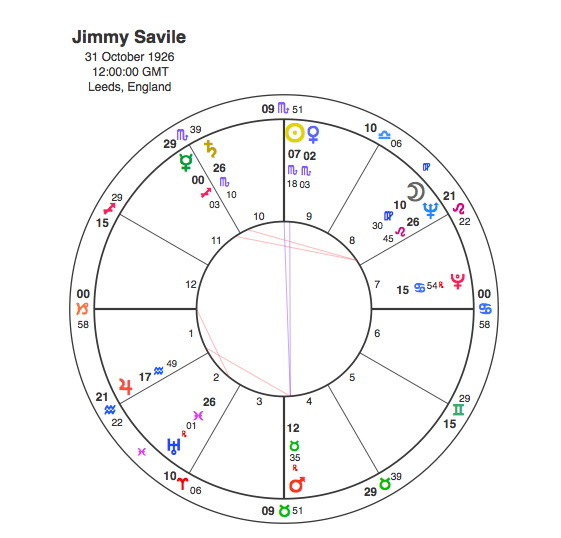 Savile does have a Sun / Mars opposition, an aspect that is surprisingly not very common owing to the relative orbits of the Earth and Mars, and its probably this aspect that prompted him to abuse so many people. Savile’s big breakthrough in TV came in the early 60s particularly with Top of the Pops in 1964. Both Pluto and Uranus were conjunct his Virgo Moon from 1962 to 65. His career peaked in the mid 1980s when Pluto was conjunct his Sun. In 1988 he was appointed chair of an interim task force overseeing the management of Broadmoor Hospital. Pluto was opposite his Mars in 1988-9 and it was eventually reported that he had abused a number of patients there. Jimmy Savile died in Oct 2011 without ever facing criminal proceedings for his actions and with his reputation still intact. If there’s one planet that calls us to account for our actions, however it is Saturn. Saturn is the principle of discipline, limitation and restraint, it is the ultimate authority that stops us behaving in whatever way we please. Everyone must have a Saturn, otherwise life would be anarchic and unmanageable. Most people exercise their Saturn by placing limits on their own behaviour but for some people who are not able to do this, Saturn brings punishment from external forces. Saturn arrived at Savile’s Sun in October 2012, almost a year after his death. A TV documentary called Exposure: The Other Side of Jimmy Savile with claims by up to 10 women, including one aged under 14 at the time, that they had been sexually molested or raped by Savile during the 1960s and 1970s, was broadcast on 3 October 2012. This programme opened the floodgates and soon there were hundreds of allegations. Savile’s reputation and legacy, things that he valued greatly were in tatters. So can a planet affect you after you’re dead ? Old Father Time, Saturn – it will definitely fix you in the end, dead or not. How’s about that then, guys and gals ? I’ve always thought (and could well be wrong) that the Death Chart represents birth into a new life: that’s it, you’ve done your time, you’re off. But this article has given me food for thought. Could it be, as the kabbalists say (if I understand their philosophy correctly) that there are different ‘types’ or levels of soul, and that transits continue to ‘affect’ the level at which we remember the person? I think they call this the Ruarch, but am not sure so will have to look it up…. No, I think I got the wrong level & spelt it incorrectly. Should have written Ruach, (the rational soul). It seems the level of soul which continues as long as people remember us (as if we were still in the room) is called the ‘Nephesh.’ I wonder if that’s the level at which planets (especially Saturn) continue to ‘affect’ us after we’re dead while another part of the soul has moved on? Another interesting read, thanks again. Thanks, it is an interesting point. As you say it probably is the ‘ Nephesh ‘. I guess the right question for the article should be ” Can a planet affect your legacy after you’re dead ? ” And the answer has to be yes.